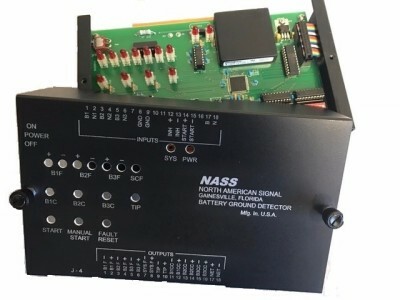 The NAS Battery Ground Fault Detector (GFD) is another automated package in the suite of automated testing products and systems furnished by North American Signal. The stand-alone unit provides ground detection analysis for up to three separate battery sources. With on-board process control this product provides automated interval testing or manually initiated testing providing true ground readings in accordance with FRA testing requirements. This unit can also be remotely connected with RS485 to other NAS units to generate automatic reports. The NAS Battery Ground Fault Detector (GFD) is another automated package in the suite of automated testing products and systems furnished by North American Signal. The stand-alone unit provides ground detection analysis for up to three separate battery sources. With on-board process control this product provides automated interval testing or manually initiated testing providing true ground readings in accordance with FRA testing requirements. Automated interval testing is field settable in either days (1-127 days) or hours (1-127 hours) by selection of on-board rocker switches. Manual testing is as easy as pushing a button. Inhibit input allows postponement of testing during the automated or manual process until input is disabled preventing unwanted grounding of the system during operation. Equipped with discrete outputs and LED indicators for ground fault display along with user-friendly terminal menus, the system is easy to use and saves countless hours in the performance of the ground maintenance test. The smart automated test algorithm provides automated control of three discrete 12 Volt 150MA outputs used to interface to an external control contactor or relay that can be used to shut off each battery charger. This feature provides automated ground readings in a power on/off state. Ground fault thresholds are field settable from .10 MA up to 20 MA in .10 MA increments allowing the user to define ground fault alarm thresholds. The GFD can be interfaced via 422 serial network connection to any of the NAS smart field analyzer units to automatically control, capture and record ground test data as part of the automated test and inspection process. Battery inputs are equipped with 10,000-volt isolation, virtually eliminating false readings due to extraneous surge currents. Additional filtering and data processing provide accuracy to a tenth of a milliamp making this the most accurate ground measurement device available for the specific application. Ground test for each battery source is accomplished in less than 30 milliseconds minimizing exposure to normal system operation. Fast, flexible and accurate, the NAS GFD allows this labor-intensive maintenance test to be accomplished in a fraction of the time and with increased accuracy.